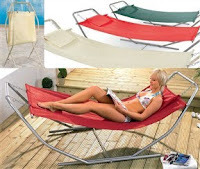 Take a look at this Folding Hammock, it is super space saving, so is easy to store, it has a sturdy steel frame and a weather resistant textured swing cover, and folds for easy storage. Available in a choice of 3 colours. Offers of the Month - OVER 250 ITEMS REDUCED!